Next week, August 19th-20th, as part of the nationwide Rock Against the TPP tour, prominent musicians, actors, comedians and celebrities will lead the charge in mobilizing to raise awareness about the Trans-Pacific Partnership (TPP). 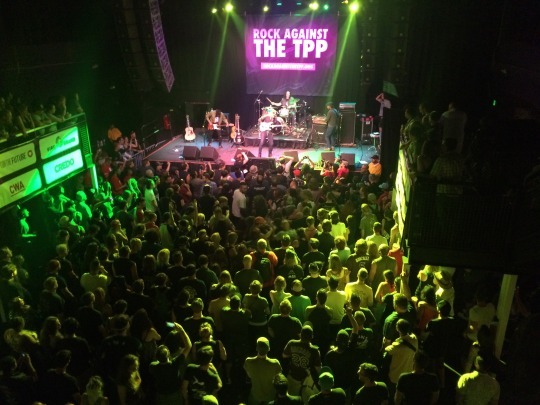 The tour, which is the largest mobilization against the TPP in U.S. history, is comprised of a series of large-scale concerts, teach-ins, and protests, in an effort to educate the public about the unpopular “trade” deal that has been a hot topic in the presidential election. Lineups at each stop vary, with high-profile participants including Rage Against the Machine guitarist Tom Morello, hip hop icon Talib Kweli, Golden Globe nominated actress Evangeline Lilly, Dead Kennedys founder Jello Biafra, comedian Hari Kondabolu, legendary punk band Anti-Flag, Hawaiian guitar hero Makana, Danbert Nobacon of the UK sensation Chumbawamba, Grammy winning Latin rock band La Santa Cecilia, ANTI records songwriter Jolie Holland, and bilingual rockers Downtown Boys. Organizers will be announcing additional dates soon. Organized by legendary guitarist Tom Morello (Prophets of Rage, Rage Against the Machine, Audioslave), his new label, Firebrand Records and digital rights group Fight for the Future, the tour is sponsored by Backbone Campaign, Citizens Trade Campaign, Communications Workers of America (CWA), CREDO, Demand Progress, Friends of the Earth, the International Labor Rights Forum, Public Citizen, Sierra Club, SumOfUs, the Teamsters, United Steelworkers. 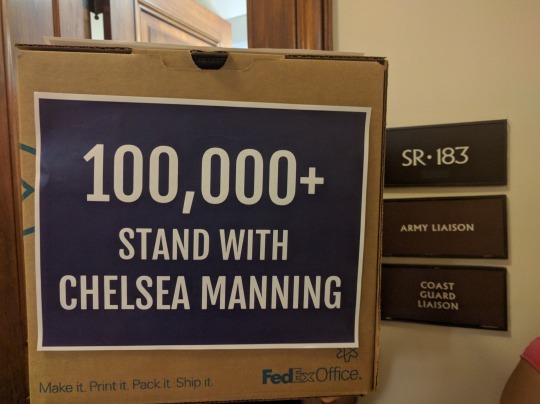 WASHINGTON, DC––This Wednesday, August 10, Chelsea Manning supporters will host a press conference by phone at 12:00 noon EST on the charges faced by Chelsea Manning in connection to her suicide attempt and efforts being made by supporters demanding that Secretary of the Army Eric Fanning drop the charges against Ms. Manning, and provide her with adequate treatment for both her gender dysphoria and her suicide attempt. 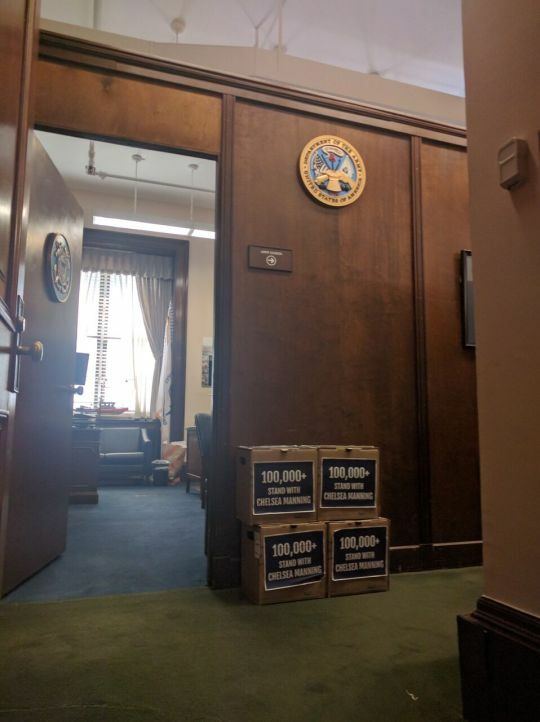 The press call will follow the delivery of more than 115,000 petition signatures to the Secretary of the Army and will feature Chelsea’s attorney at the ACLU, Chase Strangio, Pentagon Papers whistleblower Daniel Ellsberg, Fight for the Future’s campaign director, Evan Greer, who speaks to Chelsea on the phone regularly, and David Segal, executive director of Demand Progress, who assisted with the physical delivery of the petitions to the Secretary of the Army. Ms. Manning attempted to take her own life after years of mistreatment in prison, and now the U.S. government is threatening to punish her further with serious new charges directly related to her suicide attempt in July, which could lead to her being placed in indefinite solitary confinement, among other consequences. 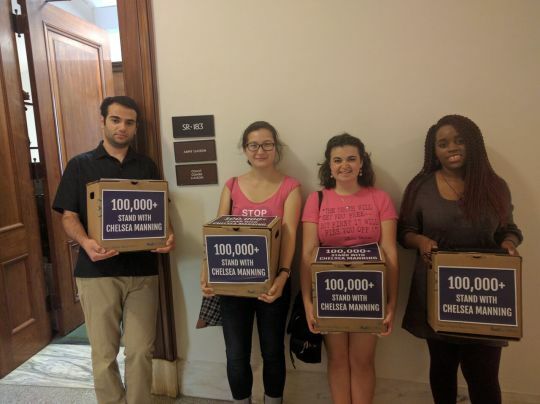 Signatures come from petitions launched by grassroots activist groups supporting Chelsea: Fight for the Future, Demand Progress, RootsAction, and Care2.